Messenger Bags are an essential accessory for the modern gentleman, presenting a perfect balance of practicality and discerning taste. Understated refinement underpins classic styling and traditional craftsmanship, while clean lines and contrasting hardware communicate contemporary taste. Business bags such as the Anderson Tote enhance a fine tuned professional image, and can be seamlessly complemented by our handcrafted leather wallets. 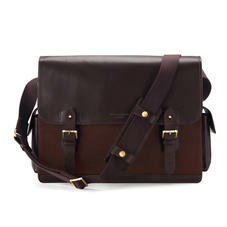 Aspinal is proud to present our stunning range of Mens Leather and Canvas Messenger Bags! Merging contemporary design and traditional craftsmanship, our new range of beautifully crafted leather and canvas messenger bags offer a really practical, smart solution for the modern mans business and organisational needs. Each handcrafted leather Messenger Bag has been meticulously crafted using carefully selected hides of premium quality smooth English bridle leather or finest quality water resistant washed canvas. The edges of each Messenger Bag are hand painted for a super premium finish and strap attachments are then individually hand stitched and strengthened with double stitching with a large shoulder pad for extra comfort. Aspinal Messenger Bags are available in a mixture of structured case and soft styles. Whether you are looking for a formal smart look or a more relaxed style, all of Aspinal Messenger Bags are robust impressive pieces that will only look better with age and use. Each Messenger Bag will arrive in an Aspinal protective felt bag. We are unable to personalise these items. Only the finest selected vegetable tanned, premium grade, Bridle calf leather is used in making our beautiful range of leather messenger bags. Each hide is carefully selected by experts and then hand-dyed using natural tannins of bark and chestnut and hand waxed to a superb deep shine finish. This natural process takes six weeks of gentle tanning, with several layers of natural tannins and finally drying in 100 year old wooden drums. This fine English tanned leather is recognised the world over for its unique quality and hard wearing characteristics and is mostly used by the best saddle makers in the world. It is envied and emulated by all. Aspinal bridle calf leather not only looks beautiful but the natural strength and characteristics of the leather look even better over time and with use. Any scuffs can be gently polished out with a good beeswax leather The solid brass zips and fittings are of the highest Swiss made quality. We know that you will be delighted with the quality, functionally and the beauty of any of our leather or canvas messenger bags. And to give you peace of mind, if for any reason you have any reservation we are of course pleased to accept any item returned to Aspinal for a complete refund within 30 days.